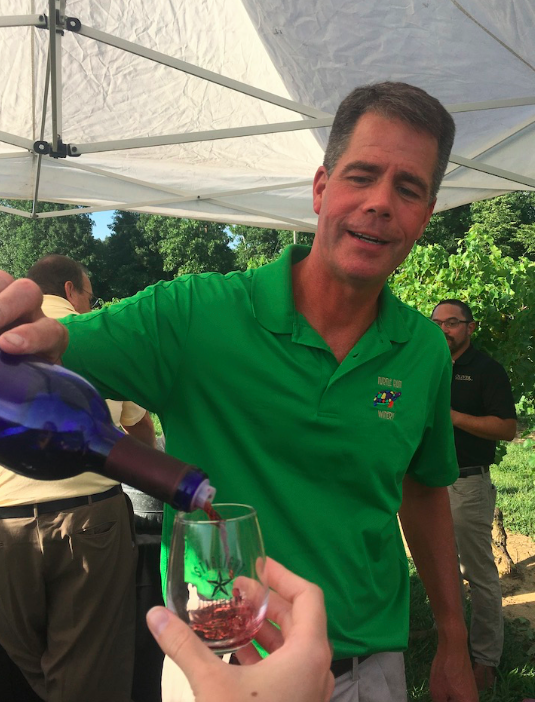 As Harvest Season came to an end, it brought tons (literally, thousands of pounds) of grapes into the wineries along the Indiana Uplands Wine Trail. On the early mornings of precisely chosen days in August through October, winemakers and vineyard teams along with family members and volunteers from the community were up with excited hands and tools picking the fresh, ripe fruit from the vines. Like every year, the harvest of 2018 brought in more than just great fruit. Along with the grapes come great stories of hard work, examples of improvisation despite excellent preparation, and triumphs and forfeits in this partnership with mother nature. Here is a peek inside the 2018 Indiana Uplands Harvest Season. An unseasonably cold April kept the vines at the cusp of budding a bit longer than usual, which was favorable. 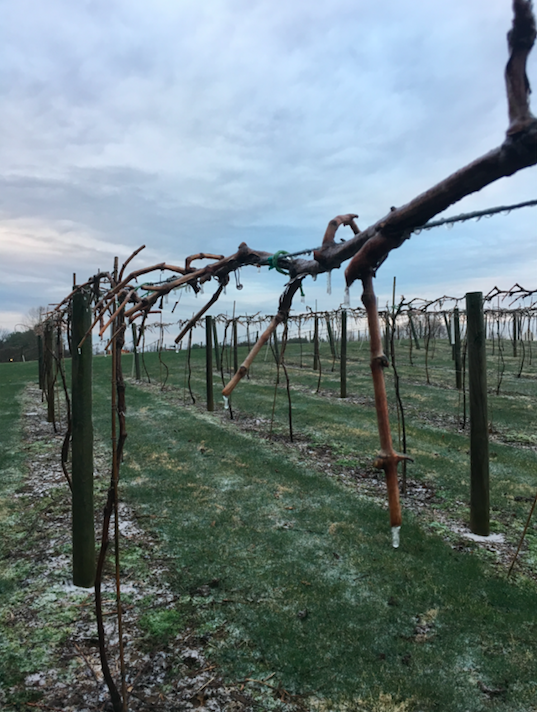 When vines bud early, it puts them at risk to freeze should our unpredictable Indiana weather bring a late frost. This Spring was linear, fortunately, in terms of temperature; Winter held on a little long but the warm weather was here to stay once it appeared! A very warm May and June followed and the vines were frenzied. So much greenery and so many gorgeous clusters! Our teams managed the canopy growth to allow each grape cluster to receive the amount of sunlight, wind, and shade ideal for it's varietal. Late Spring and early Summer were busy in the vineyards! July and August brought beautiful ripening days with long hours of sunshine, foggy mornings, and flavor development. These are the months we could begin tasting unique character in each varietal. The Catawba becomes peachy and bright, the Chambourcin deep and rich. Veraison makes the vineyard even more beautiful as the grapes grow colorful and plump! This period of ripening also means the grapes are an inviting treat for some unwelcome guests. For Jim Butler, owner and winemaker at Butler Winery, "bees were at a minimum and none of the pickers were bitten by any wild creatures." Small victories along the way make for a more enjoyable harvest season! Birds, in particular, attempt to cause trouble for our vineyards. Indiana Uplands Wine Trail winemakers sometimes go to extreme measures to keep the birds away- next time you're visiting Turtle Run Winery ask Jim Pfeiffer how he managed to use classic rock, fireworks, and a "bird blaster" to avoid giving up his grapes to the eager birds. At Winzerwald Winery, one crop of grapes in their River Vineyard was netted for bird control to protect these grapes used to make Winzerwald's Heirloom Wine. 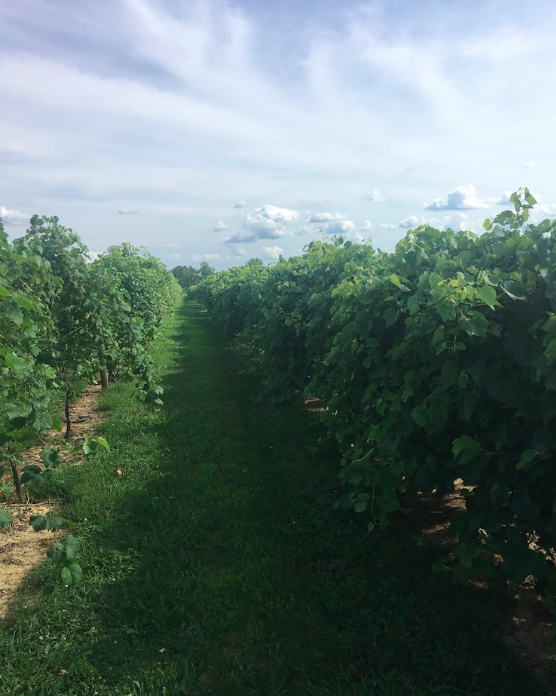 Donna and Dan Adams (owners and winemakers at Winzerwald Winery) reported, unfortunately, that some raccoon and opossum visitors seemed to make their way through the netting to picnic on the vines. Little did they know we were all planning for a really delicious wine from those grapes! There is hope for next year. 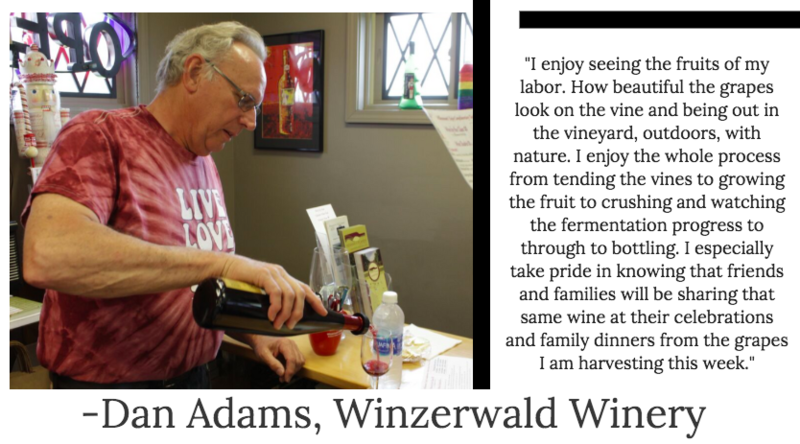 Despite that small hiccup, Winzerwald Winery enjoyed their very first harvest of Chambourcin, Traminette, and Vidal Blanc from their Ridge Vineyards! 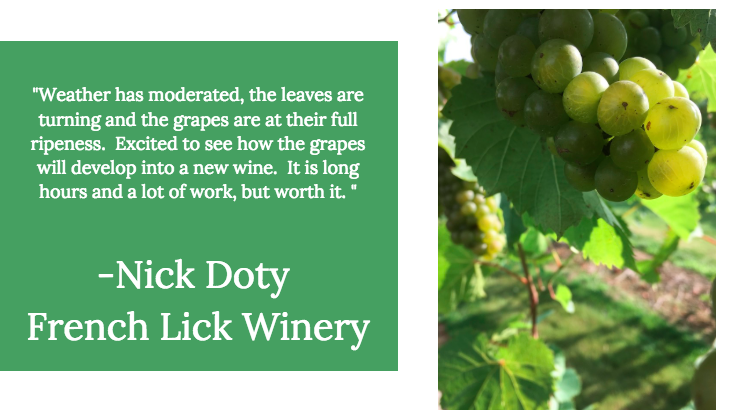 Donna Adams said, "while in very small quantities, these grapes matured well and should produce excellent first vintages." 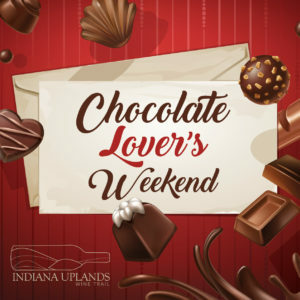 Along with Winzerwald Winery, the IUWT wineries in the further south portion of the AVA (Huber's Winery and Turtle Run Winery) tend to harvest a bit earlier than the wineries in the northern part of the Indiana Uplands (like Oliver Winery, Butler Winery, and Owen Valley Winery). The slightly warmer temperatures in the southern half of the region do allow the grapes to bud and ripen a bit earlier than those in the slightly cooler central portion of the region. September was rainy, as you may remember. Increased rain can be worrisome for some of our delicate white grapes like Traminette and Vignoles in the vineyards of the more northern wineries. While winemakers may have hoped for more sunshine days, the forecast for heavy precipitation meant careful attention and action in order to avoid rot. Increased wetness can also over-water our vineyards, diluting the sugar and acidity levels we aim for at harvest, and eroding the nutrient-rich soils from our hilly landscape. Using their years of experience and weather forecasting tools, IUWT winemakers had to devise a plan to leave the delicate fruit on the vines long enough to develop ripeness and flavor, but to harvest them before rains could cause trouble. 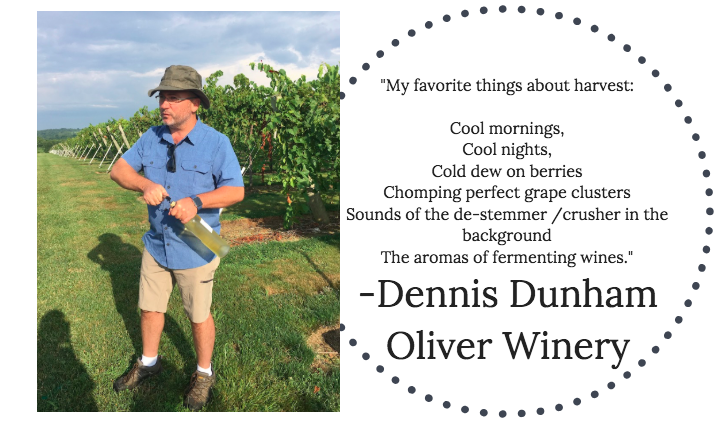 Dennis Dunham, winemaker at Oliver Winery said, "some of the varietals that could be more sensitive to the rain cooperated and ripened just before the rains came." Fortunately, the warmth of the summer had given us enough ripeness to avoid panic from the rain. Nearly 90 degree days in late September and October kept us on our toes as we wrapped up the 2018 harvest. 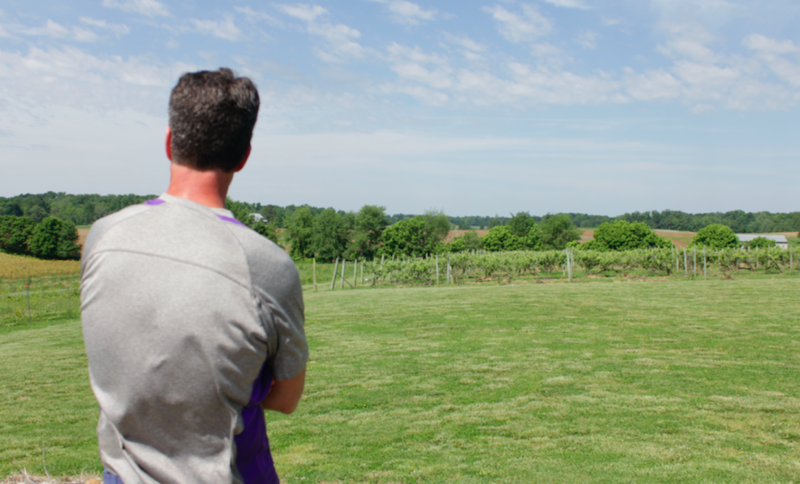 "This is what I LOVE about growing grapes here," says Jim Pfeiffer, owner and winemaker at Turtle Run Winery. "Each year delivers a new and exciting challenge." 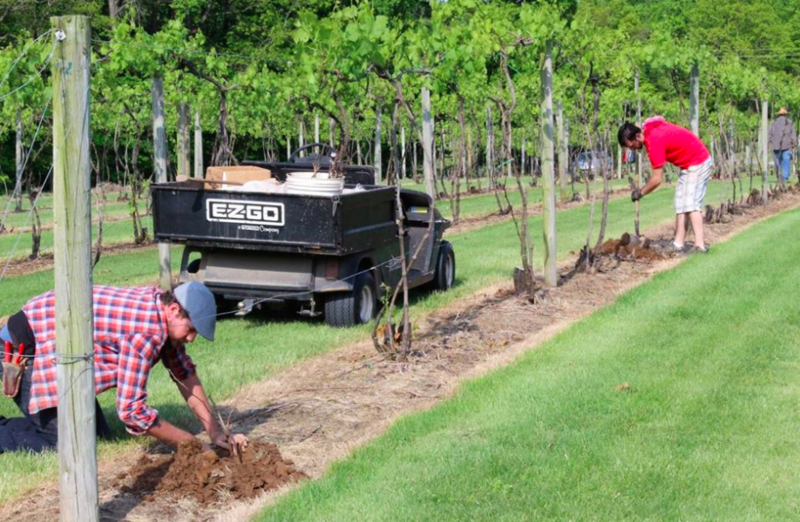 Brown County Winery just planted their first vines in 2018 and were happy to report that "none of our vines died and they all look really healthy!" The Schrodt family looks forward to harvesting a little fruit next fall, and continuing to nurture these vines for future harvest seasons! Jim Butler wraps it up perfectly. 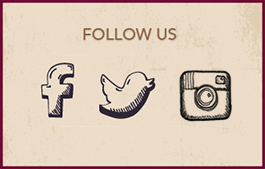 "All-in-all a good year and we are looking forward to some great wines." 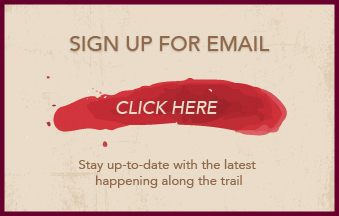 Travel the Indiana Uplands Wine Trail to learn more about our wines and our vineyards! Winter is passing by once again, and we're looking forward to the bright colors and sunlight to come with spring! Here among the vineyards in the Indiana Uplands, each season has its unique qualities and demands. Of course, we can't perfectly predict the variety of highs and lows to come in each year's weather patterns, but our winemakers and vineyard managers have plans for vine management in each season. The steps we take throughout the winter, spring, and summer optimize growth and lead to the high-quality fruit we are proud to harvest in fall. This winter has been relatively steady, considering our capricious climate. Tracking temperatures year-to-year is critical to our successes, according to Jim. He recalls the iconic 2012 "Polar Vortex" of drastically colder temperatures and explains how overall lows during winters have been lower since then. "While the overall winter average daily temperature hasn't gone down per se, our lows have gone from bottoming out around 14 degrees to now around zero or just above. That's a big difference." Despite this new normal, 2018 hasn't brought any extended dips in temperature or extremely harsh days that would throw off or concern our vineyard managers. We're still looking out for cold temperatures through April. March has been cooler than normal, which is keeping eager vines at bay. That's a good thing, Jim says, as we don't want budding new shoots to arrive too early and risk their demise with the potential of a late frost. "The longer we can extend the cold and delay bud break, the better." In keeping a close eye at weather patterns each year, Jim has noted that the weeks of April 3-8 and October 1-4 tend to bring strong cold fronts. So, we'll be happy if bud break holds on until closer to that week in April, and then the green can begin to flourish on the vines from there. The grape varieties we're known for do very well in our winters. 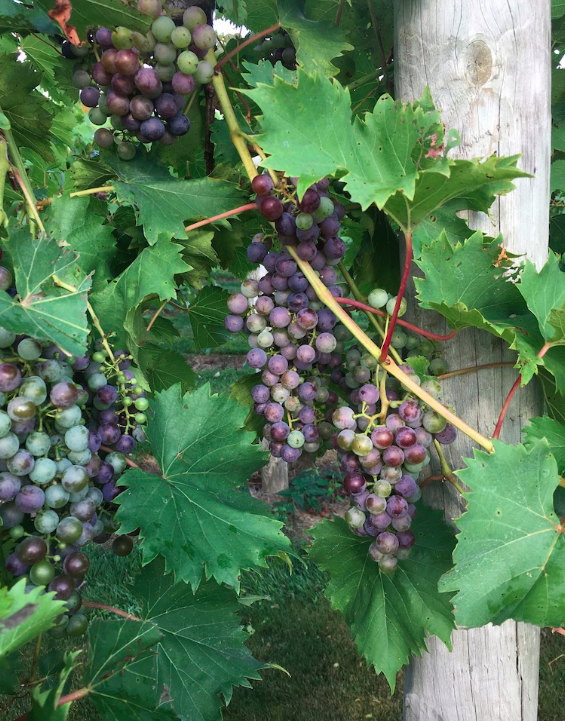 Part of successfully growing grapes in the Indiana Uplands AVA is knowing which varietals can withstand our unique climate. We're not in Central California; we are in beautiful, Southern Indiana! Our land enjoys four distinct seasons, and winter is just as important as the rest. The cold gives our vines time to rest, recharge, and get ready to produce delicious fruit. The hybrid varieties many of our wineries grow (like Traminette, Chambourcin, and Catawba) are happy here in the Indiana Uplands, and can withstand zero degree winters with little to no trouble. One of Jim's most winter-hardy varietals at Turtle Run is Frontenac: "We planted Frontenac several years ago, and every single bud is alive all the way to the end of the canes. It's crazy. Crazy awesome, that is." Our vineyard crews have been very busy pruning. "How we prune our vines is absolutely paramount to our successes for the upcoming season," Jim says. While harvest season in the fall is the height of busyness among the vines, our crews are diligent in the winter and spring, carefully pruning the vines to perfection. 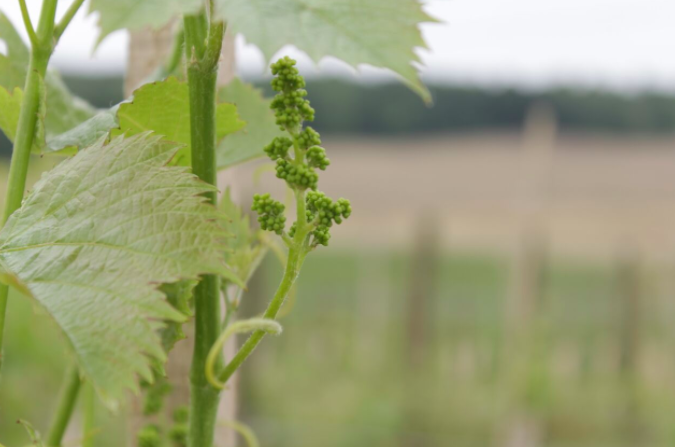 Selective cutting of shoots helps us manage the amount of clusters growing on each vine as well as the amount of leaf canopy over the clusters. It is vital that we optimize the number of grape clusters on each vine as to take full advantage of the vine's nutrition for each cluster- a quality over quantity approach. Canopy management allows us to control the amount of sunlight and the impact of cool breezes on the grapes. Sunlight helps the fruit ripen and develop rich flavors while the breezes control temperatures and help fight disease. Prune, prune, prune. 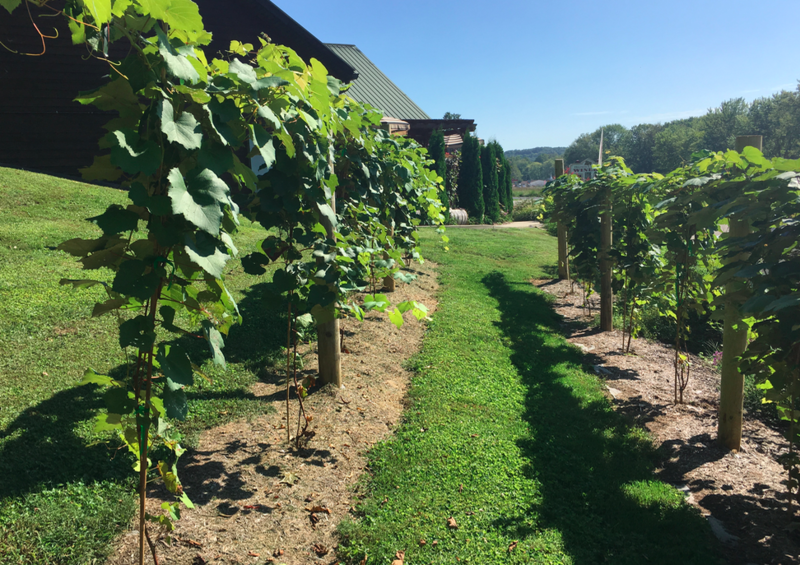 We're looking forward to a bountiful growth in our vineyards this year, and we're excited to share with you the wonderful Indiana Wines to come! 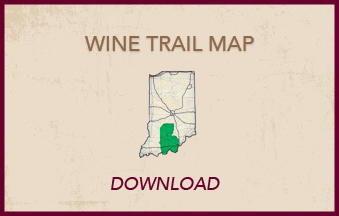 Come see us along the Indiana Uplands Wine Trail so we can pour you a glass.